If you’re planning to create a new look in your kitchen by painting and refinishing your kitchen cabinets and/or furniture, working with a professional contractor is a great option. They have the tools and experience needed to do a great job, especially if you want to restore the original look of your furniture or modify it to suit your new décor. Before selecting a contractor for the project, you should do some research to make sure they have the right skills and qualifications, a good reputation, and can work within your budget. Here are some important things to consider before hiring a contractor for kitchen cabinet refinishing. The first thing you should do before anything else is decide on your budget. How much are you willing to invest in your refinishing project? 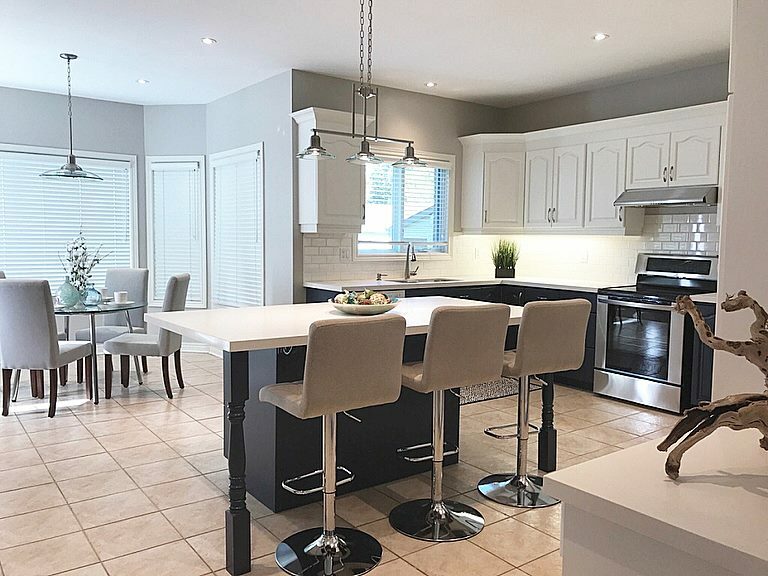 Search online or ask around to get an idea of the average prices in your area since kitchen cabinet refinishing can cost anywhere between $200 to $6,000, depending on whether you are paying for materials, labour, or both. Also, how soon do you need the project completed? Keep in mind that expediting your project may end up costing you more upfront. Unless you have years of experience with refinishing, you should always seek out professional services. Kitchen cabinet painting isn’t a simple DIY project. Contractors in this business have experience with proper prep techniques, cosmetic repair, pint types and finishes as well as staining or painting processes, which are essential in making your furniture look as good as new. Before you call a contractor to refinish your kitchen cabinets, have a look around your home and decide what other items may need to be refinished. If you plan on refinishing some antique furniture in an adjacent room, you may want to see if your contractor can do that project too. More importantly, you should find out if the items you need refinished can be refinished. Some antiques may be too damaged for a job to be done properly and others may need extra sanding and minor repairs before refinishing, which may cost more. This is why getting a free estimate is so valuable. It not only determines if the scope of the project is within your budget, but also if the contactor can make your vision a reality. Create a list of candidates and make your way down the list, interviewing each one and asking for free estimates. Don’t overwhelm yourself by getting too many quotes; however, you should contact at least two or three contractors. Your contractor’s estimate should outline the materials and steps needed for the project, and clearly identify how much each will cost. You can decide whether you want to supply the materials yourself or have the contractor supply everything you need, plus do the labour. Remember, communication between you and your contractor is vital. If they do not return your calls, you don’t feel comfortable with them or if they take too long to respond to your inquiries, it may be a sign that you should look for another contractor. Do some preliminary research about the contractor by making some phone calls, checking Google or Homestar reviews and visiting their web site. Ask if they have adequate business insurance in case of any potential issues with your project. Also, if possible visit their facility. Is it clean? Do they have up-to-date modern equipment? Do they treat your cabinet pieces and furniture carefully and with respect? “Perception is reality” is an old expression. If the owners and staff are friendly, the facility clean and organized they it usually means that your project will also be well organized, managed well and with great results you will be proud of. Getting references and referrals or checking out reviews and testimonials online from previous customers is a great way to find out if you can trust a kitchen furniture refinishing contractor. Word-of-mouth is the best way to find a qualified professional or team of professionals to handle your refinishing project. Look for details on what made working with them such a positive experience, how they handled issues, and whether the reviewer would use the same contractor again. Find out what past projects they have completed and if possible, visit those sites to see their quality of work. Inquire about out your contractor’s timing and plan of action before hiring them. It may be a good idea to do your own research about methods to refinish your furniture as well to ensure your contractor knows what they are doing. Ask about their warranties—refinishing professionals should guarantee their own workmanship. Ask what type of paint they plan on using. Is it water-based or oil-based? Will it leave a lingering smell in your home? These are all important questions your contractor should be able to answer to give you peace of mind you chose the right company to work with. After you’ve decided on your contractor, have a close look at the documents they prepared for you to see if they look professional. Ensure the written agreement has the price your agreed upon, the payment schedule (if necessary), a list of general services & responsibilities, warranties/guarantees, and a material(s) list. Once you have reviewed the documents with your contractor, you can sign on the dotted line with added confidence. To avoid delays and get the work done fast and efficiently, it’s a good idea to work with a professional, local cabinet refinishing company. For high-quality cabinet and furniture painting and refinishing, contact Booth7 – Painting Solutions. We are a one-stop, painting solutions facility. We can give your home a fresh look and new style and help you navigate the often-confusing world of renovating your kitchen, bathroom or furniture. Our experienced team offers first-rate, professional furniture painting and refinishing services, with excellent customer service. We use only water-based, low VOC lacquer and solvents that are very consumer and household-friendly. Worried about lingering paint smell and breathing in hazardous paint fumes? Don’t be…with Booth7, you won’t have that problem. In fact, we’ve never had a single complaint about lingering paint smells during or after a refinishing project. We handle all the details of your project from start to finish, so you can trust you are in good hands! To get started on your kitchen renovation and have your cabinets painted, fill out our online form or contact us at info@booth7.com. Our staff will respond to your inquiry within a few hours. Have an idea of what you want your kitchen to look like? Send us a photo of your existing kitchen and get a free consultation and estimate today!